Delivery charges are added automatically to your order and the total amount to pay is displayed before you complete your order at the checkout. The above services are for current stock items only. Although we endeavour to carry large stock of items, sometimes there may be a delay if we have sold out of a product you have ordered. If you require an item urgently then please phone the shop to check availability. Due to the change in the mail order and online retailer laws we cannot deliver a air rifle or air pistol directly to your home address. 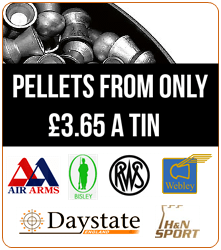 However we can now deliver to your nearest air gun or firearms dealer, for you to collect at your convenience. *Please note most dealers will charge an admin fee for this service, we charge £25.00 to accept a air weapon or firearm. It will be placed on back order for you. We will contact you by e-mail or call you with an estimated date of arrival and then given the option to amend or cancel your order if you wish. On receiving your order a signature will be required to complete the transaction. For this reason please ensure that you specify a delivery address that is convenient for you. If delivery is attempted while you are away from your stated address a card will be posted by the delivery driver stating time and date of attempted delivery and also details of the local depot so a redelivery can be organized. Next day delivery of cylinders is restricted to UK MAINLAND ONLY and will be shipped by a carrier of South Yorkshire Airguns choice. A charge of £8.50 will be added to your order per cylinder purchased. This is in addition to any other item which you may be ordering at the same time, as cylinders are transported in their own original box. 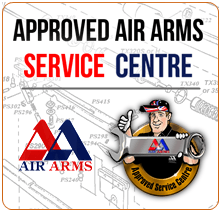 South Yorkshire Airguns is authorised to sell the products advertised. All the products sold come with the manufacturers guarantee and warranty. In the event of a fault developing please return the item to South Yorkshire Airguns and it will be dealt with as quickly as possible. If something has gone wrong with an item you’ve bought, you may be entitled to a repair, replacement or refund. You don’t have an automatic right to get your money back if you just change your mind about something you’ve bought and there’s nothing wrong with it, no matter what the cost. If you’ve changed your mind about something you’ve bought in store, even though we don’t have to do it by law you can return the items within 7 days of the receipt of the goods as long as they are not used or damaged in transit, South Yorkshire Airguns can ask you to pay if something gets damaged because it wasn’t packaged properly. South Yorkshire Airguns will also ask you to pay (Or reduce the refund amount) if you have reduced the products value, e.g. if you have purchased some dive boots, worn them outside and scuffed the soles. Any items purchased on special order, e.g. made to measure, Bespoke, Custom or end of line items have a zero days change of mind policy although you’ll still always be protected if something is faulty. Please also retain and return a copy of your receipt as proof of your purchase with your return item/s when possible. You automatically get a 14-day ‘cooling off period’ when you buy something you haven’t seen in person – Unless it’s made to measure, bespoke, custom or end of line item. The cooling off period starts as soon as you receive your order, and there doesn’t need to be anything wrong with the item for you to get a refund. Something that is an end of line item, an item that we can no longer replace, obtain parts for or repair. You need to tell South Yorkshire Airguns you don’t want the item within 14 days of the receipt of the goods. Once you’ve told us then you get another 14 days to actually return the goods back to us. All returns are to be paid for by the customer, when possible please return the item in its original packaging, you need to make sure it’s packaged in a way that means it doesn’t get damaged. South Yorkshire Airguns can ask you to pay if something gets damaged in transit because it wasn’t packaged properly. South Yorkshire Airguns will also ask you to pay (Or reduce the refund amount) if you have reduced the products value, e.g. if you have purchased some dive boots, worn them outside and scuffed the soles. South Yorkshire Airguns, 66-70 Station Road, Halfway, Sheffield, S20 3GW. Any details, name, address, contact information are not shared or distributed to any third party. UK laws apply to this agreement irrespective of the place of delivery.